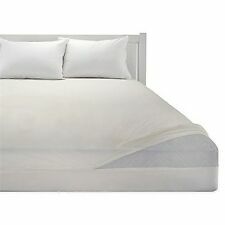 Zipped Mattress protector Cover,sheet.non noisy,water ,bugs,dust,pets,mites. The synthetic polyester material is extra thick to ensure complete bed bug protection. 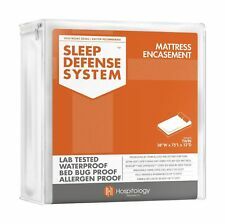 It has bite proof and escape proof qualities that you are looking for so that bed bugs cannot bite through the mattress. Comfortable 100% cotton terry towelling top section. This is our Fully Encased and Waterproof Anti-Bed Bug Mattress Protector. We call it FullyEncased because that's exactly what it is, this is a mattress protector that ticks all the boxes. This is our Fully Enclosed and Waterproof Anti-Bed Bug Mattress Protector. We call it Full Enclosed because that's exactly what it is. this is a mattress protector that ticks all the boxes. If you want the ultimate in mattress protection, then this is it. Suitable for a Bunk Bed. Luxury Fully Enclosed Quilted Mattress Protector. Unique Anti-Bacterial Barrier. 200 Thread Count Percale - 50% Cotton Percale / 50% Polyester. Diamond Pattern. All Sides and the Bottom of the protector are made with. Suitable for a Bunk Bed. Luxury Fully Enclosed Waterproof Mattress Protector. 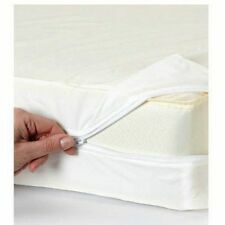 Slide your mattress in and zip up with the easy fit 3 sided zipper system. Backing - Silent Waterproof Polyurethane. Anti Bed Bug. 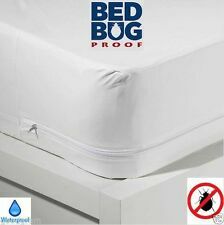 Fully Encased Waterproof Anti-Bed Bug Mattress Protector SuperKing size, 180 x 200 x 25cms. Comfortable 100% cotton terry towelling top section. 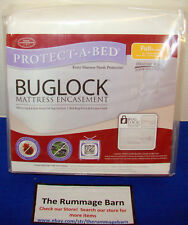 This is our Fully Encased and Waterproof Anti-Bed Bug Mattress Protector. Three sided zipper with a secure seal. Bed bug proof. Waterproof yet air vapor porous. Great for people with allergies. Polyester with a Polyurethane Laminate Membrane Fits mattresses 11" to 15" deep. 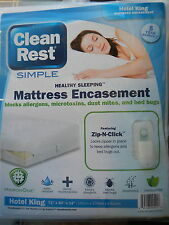 Sleep Safe EVOLON Dust Mite Bed Bug Allergy Mattress Encasement Cover - King 15"
Premium cotton terry. 100% waterproof. machine washable. blocks dust mites. Also, it is clinically proven OmniGuard® Advance lightweight performance fabric ensures that our mattress covers sleep quiet and cool, while providing the best mattress protection possible. Available in 4 sizes. If it is thicker than the 9″ height, then buy the 16″ height and tuck any excess underneath your mattress along with your sheets. This will work and protect your mattress! Also works great to protect your Box Springs (usually 9″ height). Brand New, Excellent Condition! 100% Money Back Guarantee! Offer Fast, Free Shipping! All Items Come From A Smoke Free, Pet Free Environment! Check Out Our Store For More Great Deals! 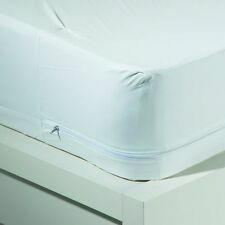 Malouf Sleep Tite Encase Queen Box Spring Protector (liquids, bugs, allergens). Condition is New with tags, sealed box. Shipped with USPS Priority Mail. The Sleep Safe Premium Mattress Protector features a 6-in-1 protection to prevent bed bugs, allergens, dust mites, pet dander, odors, and water based spills from harming the mattress. 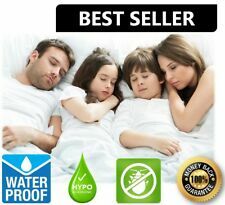 Sleep Safe™ Premium King Mattress Protector in White.